In our recent article, “Barefoot Copycat: Vibram Suing Fila USA,” we wrote about Vibram S.p.A., the manufacturer of FiveFingers footwear, and its lawsuit against Fila for patent infringement. 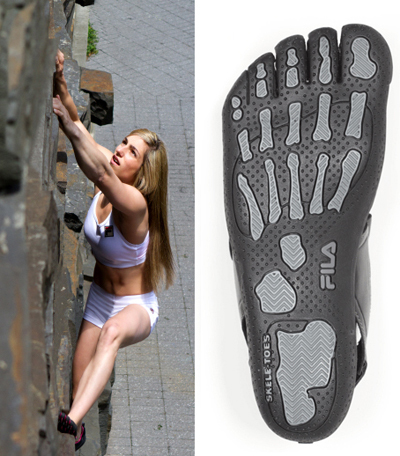 (Both companies sell similar “toe shoes.”) This week, Fila made the news, signing a multi-year endorsement agreement with rising rock-climber/bouldering star Alex Puccio. The deal will have Puccio helping to expand Fila’s reach within the outdoor and minimalist shoe categories, including for its Skele-Toes. The Fila shoes come in four styles, including shoes for men, women and children. Unlike the Vibram FiveFingers models, Skele-Toes are made to be used as casual wear (as opposed to intense activity). The Skele-toes cram your two smallest toes together in a single double-wide compartment, another distinguishing feature from FiveFingers.